The FSB Strap is a confusing part of your system settings. On this page is the best explanation that I've been able to find. Your north bridge has an internal clock speed and latencies just like your CPU and memory. 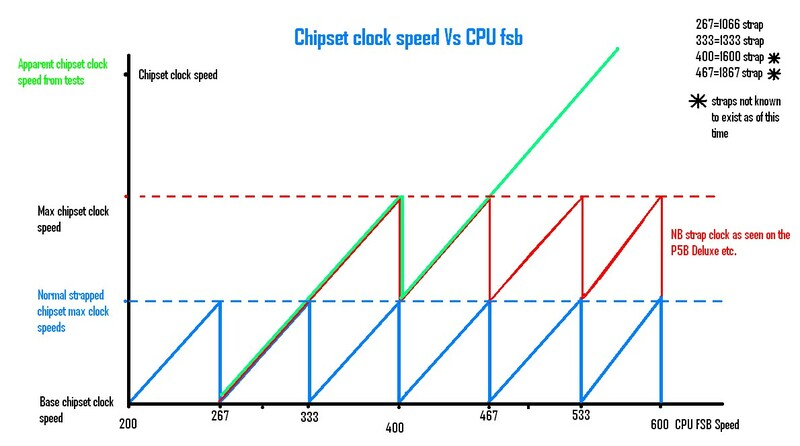 The FSB of your north bridge can be found by dividing your original CPU multiplier by your set CPU multiplier and then multiplying by your FSB. Just like your memory may be able to run at 4-4-4-12 at 1000Mhz but needs to run at 5-5-5-15 at 1200Mhz, your north bridge has a series of latencies which it must adjust in order to maintain stability at its FSB. These latencies seem to play a far more significant role in system performance than memory latencies. Intel has predefined specific latencies at specific NB FSB speeds. They are referred to as straps. There is a strap for when the NB FSB is 1066Mhz and under, 1333Mhz FSB and under, 1600Mhz FSB and under, etc. When you go from the 1066Mhz FSB strap to the 1333Mhz FSB strap, the north bridge's internal latencies loosen to allow for greater stability. ASUS has redefined the NB strap so that the 1333Mhz FSB strap does not come into effect until 401Mhz FSB (1604Mhz). Other perimeters of straps are someone unknown. Tony, the guy who pretty much figured all this out and he works for OCZ. He is now a lobbyist trying to get ASUS and other major motherboard manufacturers to give the end user the control of when straps start. 1. Boot to windows in the 1066Mhz strap and then use Clockgen to increase your CPU's FSB. You can then get to a much higher FSB while maintaining the 1066Mhz strap simply because the BIOS does not adjust the north bridge's latencies in real time. 2. Get a X6800 or QX6700 (or even a ES chip). To the north bridge, you are always at a default multiplier with a Extreme Edition processor. This allows you to set a much lower or higher multiplier without the NB FSB being effected.